You’ve read Andy Kravis’s reviews of the Saturday LA Times puzzle—now solve Andy’s weekly crossword! Visit Cruciverbalist at Law to play. 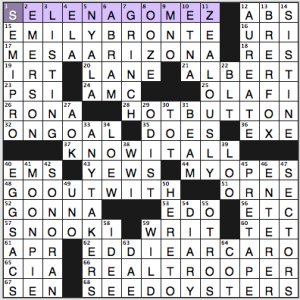 Congrats to David Steinberg for getting the “other” Selena, not the murdered Tejano singer who lives on in our crosswords but Disney star SELENA GOMEZ, into a prime crossword slot. She was one of the Disney Channel’s biggest stars, she dated Justin Bieber, and she’s breaking out of her Disney shell by starring in the new Harmony Korine movie, Spring Breakers (3 1/2 stars on Ebert’s site; opened today). I couldn’t tell you anything about the clue, though. 1a. [“Another Cinderella Story” co-star, 2008]? Doesn’t ring a bell. I’m surprised not to see a more current clue here. And them EMILY BRONTE is right up there with Ms. Gomez as my other favorite fill today. Also good: HOT-BUTTON issues, KNOW-IT-ALL, ON GOAL, utterly in-the-language GO OUT WITH, SNOOKI, MOON PIE, “ANY TAKERS?,” GRINCH, and BRER FOX. Mystery: Why 64d is COT, [Trig function], instead of regular word CUT. 66a. [Epitome of dedication, in modern usage] wants desperately to be REAL TROUPER, not REAL TROOPER. The dictionary agrees with me. If “modern usage” is there to excuse the spelling variance, I’m confused because the more established TROUPER/CUT would have made for a better crossing. Lots of Euro-crosswordese lurking in this grid. There’s 16a. [It’s bisected by the Reuss River], URI. Plus 25a. [10th-century European king], OLAF I. And 36a. [English Channel feeder], EXE (why not clue it as the file extension with all the Euro stuff?). Not to mention 51a. [Neighbor of Eure-et-Loir], ORNE. And who can forget 10d. [View from Biancavilla], ETNA (hey! an ETNA clue I don’t recognize!). Asiatic crosswordese also pops up, with EDO and TET. The juicy SECTORS of this puzzle are offset by the Euro and ENTERER material. 3.3 stars. 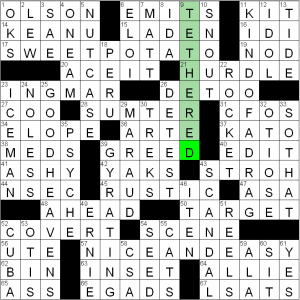 Shameless self-promotion time: If you haven’t already moseyed on over to my new weekly crossword blog, Cruciverbalist At Law, please do! Last week’s puzzle was the 23×23 I debuted at ACPT, for those who haven’t yet seen it. This week’s puzzle is already up (I’ve decided to try to sync my blog updates with my posts here), so check it out! Anyway, back to — what’s this? Someone not named Barry, Brad, or Doug with the Saturday LAT? I’m positively flabbergasted (Oh, wait. Julian Lim had it a few weeks back. Never mind — incredulity redacted.). I really enjoyed Joe’s recent Wednesday NYT puzzle punning on opera titles, and I blazed through his WSJ puzzle yesterday (I’ll avoid discussing the theme in case anyone hasn’t solved it yet), so I was excited to see his byline again. 56a, KANIN [“Born Yesterday” playwright]. The 2011 revival of this 1946 play starred Nina Arianda opposite Jim Belushi. It was a really great production, According To Jim. Ba dum chhhhhhh. Kanin’s first name is Garson, which just begs for a Greer Garson Kanin before-and-after on Jeopardy!, or possibly a [Garson who worked with many actors in the ’40s] misdirect. 57d, AQI [EPA measure of concern to asthma sufferers]. Air Quality Index. There are numerical scores (from 0-500) and a color scale as well: green is good, maroon is very bad, and don’t even ask what puce means. 3d, BEDELIA [Fictional Amelia who turns 50 in 2013].I find it strange to talk about fictional characters “turning” certain ages. 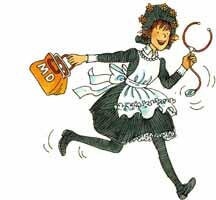 I’ll probably always think of Amelia Bedelia as in her twenties or early thirties, although it would explain a lot about Amelia’s unfamiliarity with idioms and incompetence as a housekeeper if she had been an infant during the first book. The bag is full of red crayons so she can draw the patient’s blood. 42d, SAN REMO [Riviera city with an annual music festival]. San Remo: So far from God; so close to France. 39d, ROMANIA [Cluj is its second-most populous city]. Was this a helpful Cluj for you? Ba dum chhhhhhh. 61a, QUICKTIME [Mac-based multimedia player]. Not BUICK TIME, as was my first instinct for some reason, despite having the program open on my computer while I was solving. 63a, IN THE MOOD [Up for it]. I think we all know what “it” is. Anyone else expect this to always be clued as the Glenn Miller hit? 15a, ARE WE LIVE? [“Is this being broadcast?”]. The more you stare at this question, the more existential it seems. Can we ever really be live? 11d, HOLD THE MAYO [Counter order]. I find I get better results when I make counter requests (as in “Hold the mayo, please and thank you“). 33a, SLUGFESTS [High-scoring ball games]. I love this entry. It makes me think of baseball players beating the crap out of each other. 13d, REPLANT [Tuck into a new bed]. Very cute clue for what could have been a blah entry. 10d, ORCA [Seal threat]. Seal told me he felt threatened by Matt Gaffney’s success this year at the Orcas. 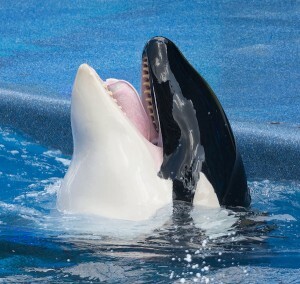 Orca, it’s not nice to laugh at Seal. A lot of this puzzle felt fresh and exciting (see, besides many of the above entries, ARABIST, SABOTAGED, ARMS RACES). There were a few entries that felt arbitrary or non-lexical to me (OF THE NOTION, MADE MONEY, and SCREWED IN got my goat, but reasonable minds may differ), and there were one or two unpleasantries (I’m looking at you, ROMES, IRED/DEMIT). I get the feeling not everyone will have been as psyched about Garson KANIN or John O’HARA as I was, but Moe isn’t my favorite ASCH (Solomon, anyone? Or even Sholem?) so maybe that comes out in the wash. This one feels like 3.25 stars to me. Until next week! 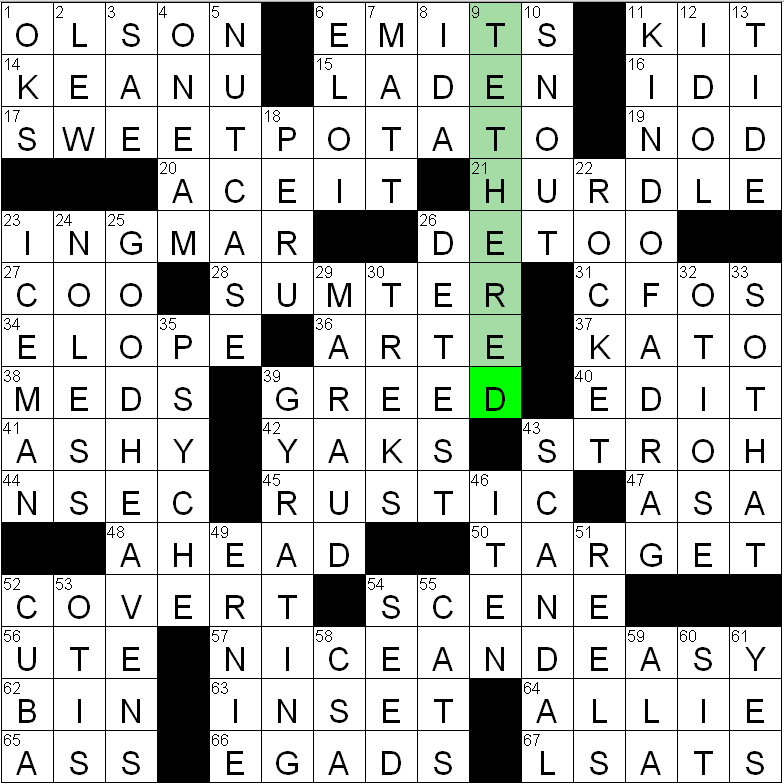 17-Across: The [Edible orange tuber] is a SWEET POTATO. One of the hottest trends in fried foods is having fried sweet potatoes in lieu of traditional french fries. I’m pretty good at shunning fries as a side, but I admit I can rationalize eating sweet potato fries because, you know, sweet potatoes are much healthier. 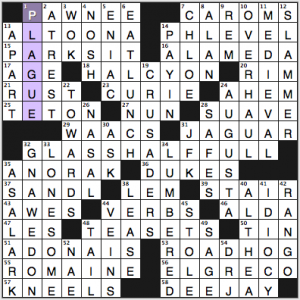 57-Across: NICE AND EASY is another way to say something is [Uncomplicated]. Just as MEAN AND HARD is another way to something is complicated. 11-Down: The [1967 #1 hit for the Buckinghams] is KIND OF A DRAG. If you were lucky enough to read a Jeffrey review of this puzzle, you’d no doubt have a link to this song by now. But nope, you’re stuck with me. Okay, okay. Here. 25-Down: GOOD HEAVENS is a [Quaint exclamation of surprise]. I always preferred “Heavens to Murgatroyd!” myself. 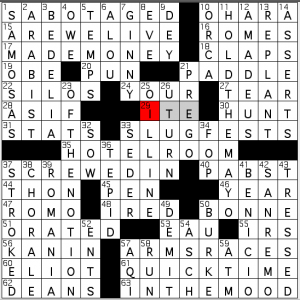 And speaking of quaint exclamations, there’s EGADS sitting down at 66-Across. Any puzzle that pays tribute to [Former game show announcer Johnny] OLSON at 1-Across has a fan in me. I also liked INGMAR Bergman, SO THAT, NO LESS, ONE AM, and MARAUD, to [Roam, pillage, and plunder]. I was less enamored of ARTE, N-SEC, AS A, LSATS, OTIOSE, SAE, and CSA, but I can’t say they ruined my solcing experience to any extent. Favorite entry = GYRATING, something [Whirling]. Favorite clue = [Prominent Gordon Gekko trait] for GREED. That, for lack of a better word, is good. Very tough puzzle. Not particularly frustrating or infuriating, not particularly fun—just a knotty challenge that in the end has played rough but fair. 1d. [Badger], PLAGUE. I had 1a: PAWNEE right away, but then filled in PESTER for 1d and settled into the northwestern quicksand. 15a. [Stops pacing], PARKS IT. Sort of slangy answer, which I wasn’t expecting from the straightforward clue. 29a. [WWII auxiliary], WAACS. The plural S threw me, as I figured only a 3- or 4-letter answer worked with the clue and decided it must be some obscure term I didn’t know. 35a. [Burberry buy], ANORAK. They sell anoraks? Hey! The Burberry store on Chicago’s Michigan Avenue recently applied a new façade to the building. It’s the trademark Burberry tartan, in a shiny metallic riff, on the diagonal Check it out. 36a. [They’re put up for protection], DUKES. As when you put your fists up to protect your face from being punched. 4d. [Chips or seeds], NOSH. I had NUTS at first, which doesn’t even make sense with the “chips” part of the clue. Further plunged me into the northwestern quicksand. 6d. [Dive into a box, maybe], EAT LUNCH. A box lunch, or any lunch in a lunchbox. 7d. [”Uncle Tom’s Cabin” aunt], CHLOE. You don’t say. 28d. [They’re still often dialed], SAFES. And also padlocks. 40d. [Lovelace’s addressee for ”Stone walls do not a prison make”], ALTHEA. Huh? It’s this poem, which I don’t think I was familiar with. 14a. [Basic measurement], PH LEVEL. As in acids and bases. 18a. [Untroubled], HALCYON. I love that word, as it’s so different from other English words. From the Greek for a mythical kingfisher bird. 24a. [Small clearing?] of the throat, AHEM. 32a. [Upbeat], GLASS HALF FULL. Great answer. My problem is that the glass is only half empty or full of a boring beverage. 53a. [Obstruction in motion], ROAD HOG. I loathe road hogs. Pick a lane and go with it! 11d. [Extremely old-fashioned], MEDIEVAL. I need to apply this word to more things. This entry was posted in Daily Puzzles and tagged Brad Wilber, Bruce Venzke, David Steinberg, Joe DiPietro. Bookmark the permalink. Funny, I’m writing a much abbreviated blog for our local library’s site and I mentioned that I had just done one of David’s puzzles from the 20 under 30 set that had a similar long entry as today’s puzzle. If the constructor reads this, were both puzzles conceived around the same time? Very hard puzzle. I only had a swath through the center and the NE filled in for quite a while, then finally got MESA, ARIZONA. I liked SEMIPRO and EDDIE ARCARO, but it took me a long time to see SELENA GOMEZ, even though my 10-year-old daughter idolizes her and Selena is much in the new this week for her non-Disney role in Spring Breakers. A PRE-TAPE is the EGGSAC of a tapeworm. Thanks for the nice writeup, Amy! @Evad, the two puzzles were conceived of and built six months apart, both some time ago. I had the same thought about trooper/trouper. I looked up google’s ngrams and it showed that “real trooper” has been on the upswing since the mid-70s and passed “trouper” by a small margin within the last 15 years. Evad, your server hates my laptop. It seems to consider it persona non grata (I can still access the site on my iPad, so I’m not taking it too personally). Would you be willing to email me so we can take this sad state of affairs off line? Can I assume you have my email? But they were going for a fresher clue. I think you’re about 98% correct, Harry. “Permesso?”, i.e. “may I [come in]? The standard response is “Avanti” — “Come forward” or “come in”. But I have heard an Italian speaker say “Prego” — i.e. “please do.” But I agree with you. The basic meaning of “prego” is “You’re welcome.” The clue is very close to wrong. The Russian “Pazhal[ui]sta also means “You’re welcome” and has some similar idiomatic usages. Amy, re the NYT crossword, thank you for “66a. [Epitome of dedication, in modern usage] wants desperately to be REAL TROUPER, not REAL TROOPER.” Despite the “modern usage” disclaimer and the greater variety of spellings allowed on Saturdays, and despite the research cited by Dan showing the “trooper” spelling to be more common, Will has gone too far this time. People use the spelling “trooper” because they don’t know what they’re talking about, or what a trouper is. Freedom to use variants comes with freedom to choose what to use.